Bring the wonders of the night sky to your library or community. Programs can be tailored for all ages. Visitors begin by exploring our mobile science museum. For younger students we use a “show & tell” format, older visitors and families are free to explore the exhibits. Exhibits include meteorites, photos, NASA memorabilia, space/aircraft models and more. Visitors are taken on a tour of the current night sky, including how to find the planets and a review of the brighter constellations. Each tour is tailored to the age group and last about 1/2 hour. Visitors will learn about telescopes and safe solar viewing. Then weather permitting telescopes will be setup outside for students to view the Sun through our specialized safe solar telescope. We’ll have regular telescopes for viewing the Moon or planets if they are visible in the daytime sky. Weather permitting telescopes will be setup outside for visitors to view the Moon, Planets and other celestial wonders. 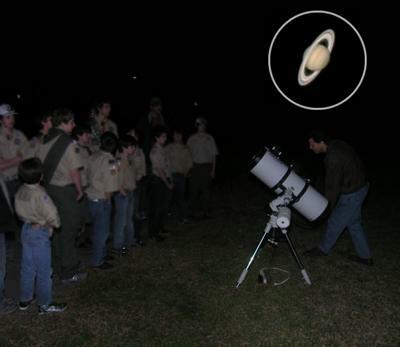 Scouts preparing to look through a telescope. Inset: An image of Saturn taken through the same telescope students use! Click here for program rates, requirements, and scheduling.